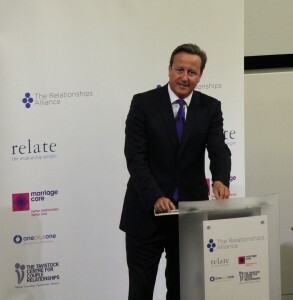 Following the Prime Minister’s announcements today regarding the Government’s policies on families and relationships, David Cameron appeared on stage at the Relationships Alliance Summit to reinforce his messages on the importance of helping families stay together. The Prime Minister revealed how a range of measures will focus on ‘helping new parents, supporting couples to stay together and addressing the underlying causes of family breakdown, alongside a new commitment that will ensure promoting family life is placed at the very heart of Government decision-making’. In his closing remarks after the Prime Minister’s address, Mark Molden, Chief Executive of Marriage Care said ‘Relationships are the hidden assets behind a productive, resilient, cohesive society and it’s time to unlock their potential. Sometimes that potential reaches ‘summit’ moments that we should celebrate and sometimes that potential has to be protected in those dark valley moments. But mainly the treasure is to be found in supporting relationships as they traverse the normal foothills and seasons of life and I hope you will agree that the case for doing so is overwhelmingly positive. The relationships support sector has been a hidden asset too and it’s time to unlock its full potential if we are to deliver the full spectrum of support needed and some of today’s announcements are a very positive step in that direction’. Ensuring that every new domestic policy “will be examined for its impact on the family” rom October 2014. Offering help to over 500,000 families via a programme to support those facing multiple problems, such as unemployment, anti-social behaviour, debt and truancy. The programme expands from its current focus on 120,000 families, with work starting immediately in over 50 council areas before spreading across the country. The Relationships Alliance – formed of Relate , Marriage Care , OnePlusOne and TCCR, – is pleased with today’s announcements and sees them as extremely positive steps towards making relationship support more accessible for more people. Furthermore, Ruth Sutherland, Chair of the Relationships Alliance and Chief Executive of Relate, said ‘We wholeheartedly agree that strong and stable relationships are the bedrock of society and it is excellent to hear the Prime Minister affirming the importance of the Government’s role in supporting them. Every day, we see the impact that troubled relationships have on individuals, couples and families. That’s why we’re so passionate about equipping more people with the relationship skills that will help to see them through good times and bad.